The beginning of May and official summertime was marked in more ancient times by the fire festival of Bealtaine. Bealtaine falls close to the astronomical cross-quarter day, half way between the equinoxes and the solstices. It is known to have been celebrated from at least medieval times and marked a time of reckoning when rents and debts were due and workers and servants were hired for the season ahead. Its significance in more ancient times is more obscure. The actual astronomical cross-quarter day this year falls on the 5th of May however the festival in the modern calendar is fixed on the 1st. Beltany Tops stone circle sits on a hilltop in Co. Donegal, not far south from the village of Raphoe. 60 or so stones remain from what was likely to have been a contiguous kerb-like circle around a raised platform 45m in diameter. It also features two outlying stones. It probably pre-dates the ‘Celtic’ calendar festivals by several thousand years, however we cannot be certain that people in the Neolithic or Bronze Age did not have a similar calendar or festivals. 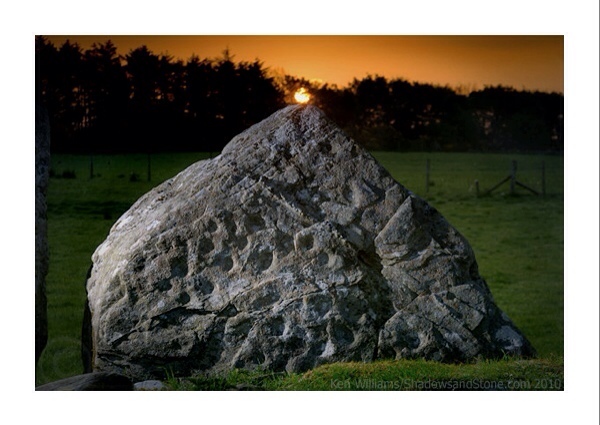 Various astronomical alignments have been claimed to exist at the circle, however the most intriguing is the Bealtaine sunrise, possibly marked by a triangular stone whose inward face is covered in cup-marks (small round depressions hammered or ground out of the surface of the stone and the most common form of prehistoric rock art). Around the cross-quarter day the sun rises directly behind this stone, as can be seen in the title photo of this post. The name ‘Beltany’ also happens to be an anglicisation of ‘Bealtaine’, adding another interesting layer of association. The above photos were taken on a perfect sunrise on the actual cross-quarter day in May 2007. The sunrise is now partly blocked by nearby trees but the effect is still quite spectacular to witness as the first limb of the sun peeps through the branches directly behind the cup-marked stone which is pointed, almost like a target. This entry was posted in Astronomy, Events, Megaliths, Prehistoric Ireland, Rock Art, Stone Circles and tagged bronze age. Bookmark the permalink. Wonderful photos. 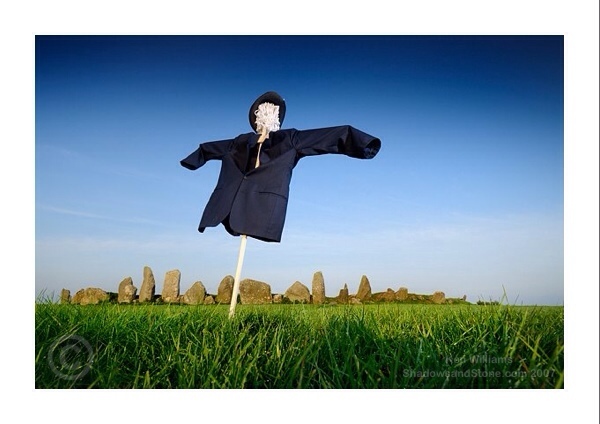 Love that “pointing” stone, and the scarecrow. Enjoyed the article very much. Well done.